The Russians aren’t coming — they’re already here, and are poised once more to make a medal run in Buffalo. Will it be another repeat of 2011 when Russia took Buffalo by storm and won it all? Seven years ago was one of the finest examples of what momentum can do for a hockey club. The Russians came like a snowball running down a hill, particularly in the gold medal game, and they just could not be stopped. This is a very different looking Russian squad though for the 2018 tournament. It’s one that appears ever-capable of taking a medal, but some questions remain as to whether it will be a gold. Head coach Valeri Bragin is looking to work that same magic that he conjured up in Buffalo the last time one of his U20 teams played here. Players like Mikhail Berdin, Klim Kostin, and Andrei Svechnikov at least will be key ingredients for concocting a medal-worthy team. Mikhail Berdin (Sioux Falls Stampede), Alexei Melnichuk (SKA-Neva St. Petersburg), Vladislav Sukhachyov (Chelmet Chelyabinsk). Vladislav Sukhachyov returns to Russia’s U20 team after being one of the goaltenders who helped get them a bronze last year. Appearing in one game against Latvia in 2017, he pulled out a 9-1 win at Toronto’s Air Canada Centre. Sukhackyov has been playing for Chelmet Chelyabinsk this year in Russia’s VHL, which is one step below the KHL. There he has a 2.27 goals-against average and a .930 save percentage in 20 games. The 6-foot-2, 163-pound Mikhail Berdin is a sixth-round selection of the Winnipeg Jets in 2016. He has played phenomenally in the USHL for the Sioux Falls Stampede. In 49 games between this season and last, Berdin has posted a record of 23-16-4. This year he has a .930 SV% and a 2.63 GAA. While Sukhachyov has the previous experience, do not be surprised if Berdin receives the bulk of the netminding duties. He is just that good. Alexei Melnichuk has gotten into two KHL games this year for SKA St. Petersburg. His 2.68 GAA and .900 SV% are certainly decent for two professional level games. Melnichuk has played the bulk of the season in the VHL with SKA-Neva St. Petersburg. Like Berdin, he has posted some truly excellent numbers. A 1.95 GAA and a .926 SV% across 13 games for SKA-Neva. All three goaltenders are most capable, but Russia’s best bet should be Berdin. Nikolai Knyzhov (SKA-Neva St. Petersburg), Nikita Makeyev (CSKA Moscow), Artyom Minulin (Swift Current Broncos), Dmitri Samorukov (Guelph Storm), Alexander Shepelev (Chelmet Chelyabinsk), Vladislav Syomin (SKA-Neva St. Petersburg), Anatoli Yelizarov (Tolpar Ufa), Yegor Zaitsev (Dynamo Moscow). The Swift Current Broncos’ Artyom Minulin could be the quarterback that Russia needs on their defense corps. You have to love this young man’s size at 6-foot-3 and around the 200-pound mark. More importantly, though, Minulin is generating offense from the back end and creating opportunities. During last year’s WHL season, he posted a sizable 42 assists in 70 games. Minulin was also a plus-28 that season too. In 174 games for the Broncos, he has 18 goals, 84 assists, and 102 points. Just a superb defenseman that would make any team green with envy by not having him on their roster. Another defender for the Russians with WHL experience is Anatoli Yelizarov. 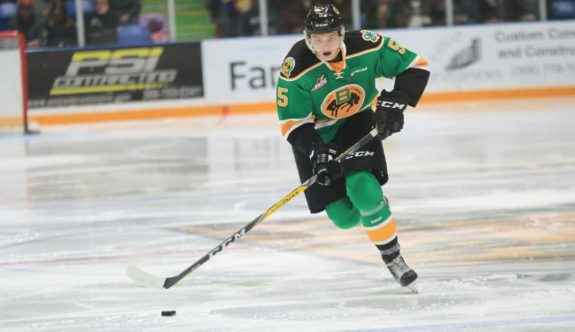 The Kazakhstan-born defender played junior with the Edmonton Oil Kings for the 2015-16 and 2016-17 seasons. In 124 games for the Oil Kings Yelizarov had nine goals and 12 assists to go with 110 penalty minutes. He has played 14 games in the KHL this year with Salavat Yulaev Ufa, has a lone assist and is a plus-three. Dmitri Samorukov was the 84th selection of the 2017 NHL draft. Chosen by the Edmonton Oilers, he has been playing quite well in junior with the OHL’s Guelph Storm. Though a little lean, Samorukov is still 6-feet-2-inches and is a good puck-mover. With Guelph this season he has four goals and 11 assists in 32 games. Though not the top defense at this tournament, you cannot help but like who made the final cut for Russia’s blueliners. They are a sound defense and can get the job done. Minulin does need to fill that quarterback role though, no matter what. Vitali Abramov (Victoriaville Tigres), Andrei Altybarmakyan (SKA-Neva St Petersburg), Georgi Ivanov (Lokomotiv Yaroslavl), Artur Kayumov (Lokomotiv Yaroslavl), Klim Kostin (San Antonio Rampage), Mikhail Maltsev (SKA-Neva St. Petersburg), Artyom Manukyan (Avangard Omsk), Alexei Polodyan (SKA-Neva St. Petersburg), German Rubtsov, (Acadie-Bathurst Titan), Marsel Sholokhov (Chelmet Chelyabinsk), Dmitri Sokolov (Sudbury Wolves), Andrei Svechnikov (Barrie Colts). 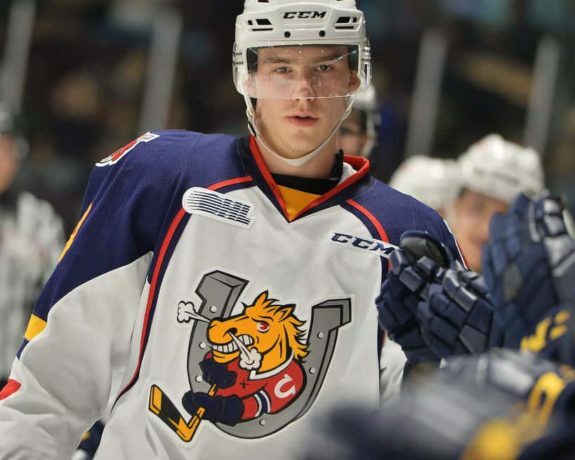 There is no doubt that Andrei Svechnikov of the Barrie Colts will be one of the most exciting players to behold in Buffalo. Most predictions are that the 17-year-old (who will turn 18 in March) will be the second player selected overall at the 2018 NHL Draft. At 6-feet-2-inches and over 185 pounds, Svechnikov has ideal size. His offensive production is just tremendous, and that is what will make him so integral for Russia. Last year he played in the USHL with the Muskegon Lumberjacks and had 29 goals and 29 assists for 58 points in only 48 games. This year Svechnikov is playing in the OHL for Barrie and has 14 goals and 7 assists in just 16 games. An electrifying forward, Svechnikov is Russia’s best player and could prove to be the best player for any team in Buffalo. Klim Kostin was the 31st selection over the summer and he was chosen by the St. Louis Blues. You have to love everything about his size at 6-foot-3 and over 210 pounds. Not only is Kostin skillful, but he can be a power-forward which is a style of player Russia is not often known for. He has been playing for the Blues’ AHL affiliate, the San Antonio Rampage, and has two goals and nine assists in 26 games, plus some 47 penalty minutes. Philadelphia Flyers’ fans will want to keep an eye on German Rubtsov. After all, the Flyers drafted him in the first round (22nd overall) in the 2016 draft. Rubtsov has spent the past two seasons playing QMJHL for Chicoutimi Saguenéens before coming over to Acadie-Bathurst Titan. Between the two teams, Rubtsov has 17 goals and 30 assists for 47 points in 41 games. If Svechnikov, Rubtsov, Kostin, and Minulin can be 2018’s version of Tarasenko, Panarin, Kuznetsov, and Orlov, then there is no reason that Russia cannot do well in the medal round. A third-place finish for the Russians in 2017 does not sit well. In some ways, Russia feels that Buffalo is their territory. History speaks for itself, and having Bragin back at the helm may invoke some sort of good karma. Svechnikov is very young and this will be his first U20 tournament. Regardless, he is so vastly talented that he is capable of turning this entire tournament on its ear and being the most pivotal player at these games. One guy alone does not win championships, but he can certainly make it more likely to come to fruition. Svechnikov is a player who can play otherworldly, and his ability to do so could even justify gold if he is not contained. Russia is not likely to take gold. If the stars align, silver could end up being draped around their necks. More likely, however, it will be a bronze or a fourth-place finish for the Russians. They are a very capable hockey team, but teams like Canada, Sweden, and the USA have deeper rosters.